Yes, I know it is only natural to eat (!) but sometimes I forget I have not eaten all day and my stomach does not complain. Sometimes I think I need to put a reminder somewhere noticeable so that I do not forget. There have been periods in my life that I lose weight just because I am so busy working that I neglect to eat! Sometimes I catch myself frowning, while I type away or focus on new information that will help me translate better the original text. This also happens when I research online for a term I have never come across before in my life. Oh, all those deep expression lines dig my forehead… Some of the faces I make are quite scary, too! Thank God I work from home! 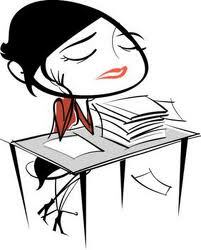 Long working hours sitting on a chair can cause pains in the back and behind the neck. The problem is that I tend to be in one single position throughout the day and for many hours without even standing up! As a result, I started to experience pains. I joined a gym! Yes, I know, sometimes the hour that I invest exercising my body does cost me an hour of less sleep, but I would rather sacrifice it than have pains that may turn serious in the future! I read somewhere that offices with view to trees or greenery in general relax the employees. So when I moved house, I chose to accommodate my office in the room with the tree view! While I work, I take my eyes away from the computer screen and look at the leaves on the tree’s branches. I do not know if it will work for you, but I admit my eyes take a rest in minutes! When one project finds you, more will come! Try to get enough time to work on the projects, do not agree on impossible deadlines that you know for a fact you cannot meet. Inhuman deadlines require inhuman measures! Do not forget that you are not a machine! Are there any other tips you can add to the above suggestions? Please, do send them to me!